NEW YORK, Dec. 5, 2017 /PRNewswire/ — December, with all celebrations and meetings, is one of the times of the year when everyone boosts sugar levels, whether that’s from eating brownies, cookies, or muffins. Olives from Spain have decided that these baked goods are a delicious opportunity in which the Mediterranean touch can be incorporated and have created recipes to enjoy olives, even during desserts. 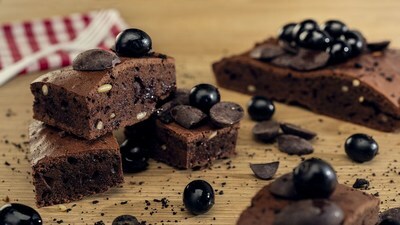 Black olives and dark chocolate are incorporated to put a new spin on everyone’s favorite gooey cake. The second recipe features olive oil as well as olives, a lighter alternative to butter.